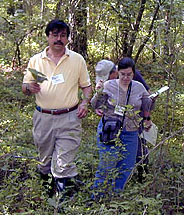 The Hancock Biological Station at Murray State University is one of five national field stations participating in the Faculty Insitutes for Reform in Science Teaching II sponsored by the National Science Foundation. Teams from five regional academic institutions have been selected to participate in a series of workshops for implementing inquiry-based teaching in their science courses and initiating undergraduate curriculum reform. I am a professor in the Department of Biological Sciences at Murray State University (MSU). I obtained an M.S. degree from VA Polytechnic Institute and a Ph.D. from Indiana University. My research training is in the area of physiological ecology, primarily with small mammals. My research interests include energetics, effects of habitat fragmentation on the physiology and fitness of small mammals, and curriculum development. I have been employed at Murray State University for nine years during which I have served as the advisor for the Secondary Education in Biology program. My teaching experiences include human and animal physiology, human and comparative anatomy, embryology, developmental biology, histology, genetics, mammalogy, field ecology (in Belize and Ecuador), and physiological ecology. 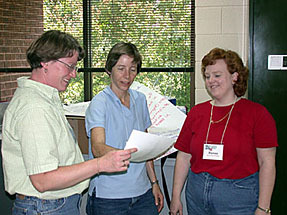 My interest in improved teaching and curriculum development began with my work on the BioQUEST project at Beloit College, WI. Through BioQUEST I became involved in the development of methods to enhance active learning by students. At MSU I have helped to develop and implement an inter-disciplinary science course, based on the National Education Standards, for elementary and middle school education majors (CHE/Eisenhower Foundation). Currently I am leading a project to revise our introductory biology program for majors through implementation of inquiry-based courses (NSF-CCLI A&I). I am also participating in the Pre-College Outreach component of our Howard Hughes Medical Institute project that involves collaborations between university faculty and local high school teachers. Teaching through research also plays a significant role in my professional activities. I regularly mentor undergraduate and graduate research students. I am active nationally as a member of the American Society of Mammalogists, the Association for College and University Biology Educators, the Council on Undergraduate Research, and the BioQUEST Curriculum Consortium. I have a bachelor's degree in Biology from Hollins College, VA and Master's degree in Environmental Biology from Hood College, MD. I am currently finishing a Ph.D. through a joint program between Murray State University (MSU) and the University of Louisville. My research focuses on physiological mechanisms that influence female mate choice in small mammals. I have also been teaching part-time in the Department of Biological Sciences of MSU for the past eight years, teaching courses in Human Anatomy and Physiology, Principles of Biology, Etymology, and Introduction to Science. Through the influence of mentors, meetings, and workshops such as FIRST, I have been incorporating inquiry-based learning techniques in my courses. I hope to obtain a teaching position so that I can work full-time on curriculum development. I am an experimental nuclear physicist with research interests in the area of light heavy-ion reactions. After earning my B.S and Ph.D. degrees from the University of Notre Dame in 1972 and 1976, I was a post-doctoral research associate at Florida State University. 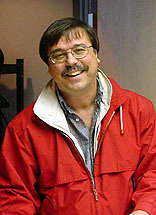 Subsequent to this appointment, I became a member of the physics faculty at Tennessee Technological University where I specialized in teaching introductory calculus-based physics and developed one of the first research programs involving undergraduates funded by the Department of Energy's (DOE) Division of Nuclear Physics. In 1988, I joined the staff at Argonne National Laboratory where I had oversight responsibility for all faculty, graduate student and undergraduate outreach programs that placed participants in the research laboratories of Argonne staff. Approximately 700 college level participants came through this program annually. In 1994 I was asked to join the staff at DOE headquarters to co-manage a new grant program to assist non-competitive states to become more grant competitive for federal research funding. In addition to soliciting and reviewing grant proposals, site visits were conducted and grant development workshops were hosted annually. I assumed the position of Dean of the College of Science, Engineering and Technology at Murray State University in 1998. 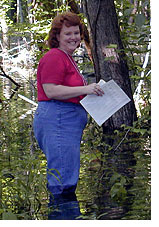 In addition to numerous individual faculty research awards, during my three year tenure as Dean, the College successfully competed for a $1.5 million Howard Hughes Medical Institute award, an $800,000 NSF Collaborative Research at Undergraduate Institutions award and three NSF Course, Curriculum and Laboratory Improvement grants totaling over $600,000. While final word has not yet been received, I am optimistic that a $1.5 million NSF Experimental Program to Stimulate Competitive Research award to support Murray State's environmental science program will also be received. Today, I am the Director of Murray State's Undergraduate Research and Scholarly Activity (URSA) office and the Project Director of the Howard Hughes Medical Institute award. The mission of the URSA office is to grow undergraduate research and scholarly activity across the entire campus. For over 15 years, I have been a leader at the national level of the movement to incorporate undergraduate research and scholarship into the undergraduate educational experience. I have been the President of the Council on Undergraduate Research and the Chair of the American Physical Society's Committee on Education. I am currently an associate professor of mathematics and statistics at Murray State University. I received my Ph.D. from the University of Tennessee, Knoxville in 1996 and have been at Murray State since then. I teach math courses ranging from a liberal arts math course to graduate partial differential equations. I have continually tried to use discovery techniques and collaborative work to enhance my and my students' learning. It has proven fruitful, and I am still learning how to most effectively use different strategies to teach mathematics. My research stems from differential equations with applications in cancer, HIV, and population models. Specifically, I try to determine the optimal way to give drug treatments or to harvest a pest in a given population. I have worked with undergraduates on such problems and have gained so much from them. This project is supported by the National Science Foundation. Opinions expressed are those of the authors and not necessarily those of the Foundation.